This is the Ebook version a Softcover is available with a preview. See below. 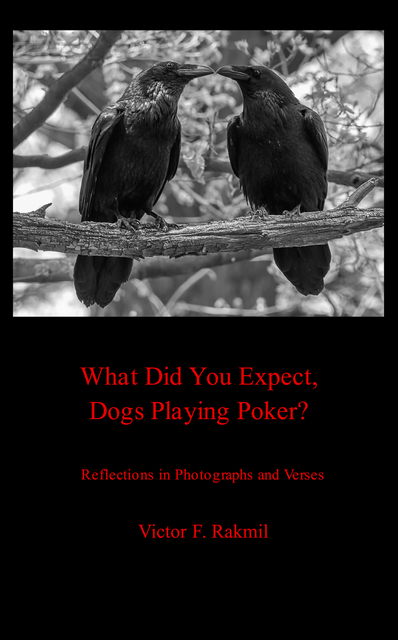 A former Canadian diplomat and a life long photographer, Mr. Rakmil has created a book of photography and verse that speaks to his life, travels, work and observations. The title is a reminder that expectations and reality are major players in life. This is not the usual autobiography of a diplomat, it’s a series of vignettes and opinions from many years of unusual and often exciting experiences. Mr. Rakmil’s passions for photography, writing and a life well led are the foundations of this book and its delight lies in the details. Mr. Rakmil is a Canadian. He has lived in Africa, Asia and Europe. He has worked as a photographer, economist and for most of his career as a diplomat. He spent considerable time working in the field of international security. His final diplomatic assignment involved assisting Canadians caught up in the Arab Spring, the coup in Cote d’Ivoire and the earthquake in Furoshima. In retirement he has returned to old habits of photography, writing, listening to blues music and drinking good bourbon. Mr. Rakmil’s photography blog and website can be found at rakmilphotography.com.